Long live the king! Blackagar Boltagon is back! In a big way as this new Inhumans series kicks off in extremely exciting fashion. Charles Soule does a fantastic job of capturing the classic sensibilities that made the Inhumans the thinking man’s X-Men way back when their original series debut in 1975. However, Soule’s Inhumans does not feel dated in the least; in fact this new series with all of its traditional Inhuman tropes is a perfect introduction to these characters as well as a primer to the franchise as a whole. This title is not, as many have speculated, an attempt to sway X-Men readers over to Marvel’s “second string team” in light of the fracas over film rights, far from it, The Uncanny Inhumans is a bona fide, top tier project featuring some of Marvel’s leading creators in Mr. Soule and artist Steve McNiven; to think anything other than that is an insult to the talent and material involved. If this first issue (or zero issue actually) is any indication, we can expect a far more Black Bolt-centric narrative from this series than we have been getting in Soule’s other title in the franchise, Inhuman which focuses on Queen Medusa’s trials and tribulations in the aftermath of the fall of Attilan as well as the recent Terrigenesis event; the writing duties on which are set to be taken over by current series artist, Ryan Stegman. At the start of this issue, a still very much disgraced Black Bolt seeks an audience with his now estranged wife, the reigning Inhuman Queen Medusa to discuss their son Ahura, who at this time remains missing. Soule weaves in some rather clever plot threads that could serve as the focus for future issues such as the bounty hunters at the beginning of this issue seeking to get rich by poaching Inhuman cocoons. From there Soule continues to impress and surprise as he shows an astute understanding of how to write the essentially silent main character, Black Bolt which is in and of itself no easy task let alone to do it as well as Soule does here. 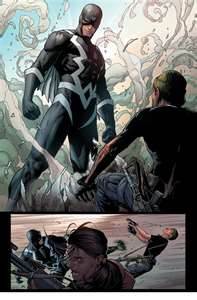 He does so without relying on any narration at all, not even an inner dialogue in Boltagon’s head, instead he places his faith in the uber-capable hands of artist Steve McNiven to capture and portray Black Bolt’s thoughts and emotions through facial expression and body language. McNiven rises to the occasion in stellar form rendering Black Bolt’s seemingly limitless pool of completely nuanced emotions ranging from subtle fear to an almost incapacitating guilt to a self-defeating apprehension, just to name a few ,and he does it with a remarkable aptitude for accuracy. This is the second collaborative effort from McNiven and Soule who also brought us the equally brilliant Death of Wolverine last year. In that series the two creators seemed to have forged a chemistry that continues to serve them very well. 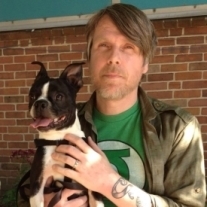 Colorist, Justin Ponsor adds an effervescence to the entire work with his dynamic palette of vibrant hues. Ponsor perfectly complements McNiven’s meticulous pencils bringing Soule’s narrative to vivacious life. The issue closes with a snippet written by Inhuman artist, Ryan Stegman with the imaginative art of Ryan Lee. This is a much lighter piece featuring newly revealed Inhumans, or as they are called in the book, Nuhumans Iso and Flint. The story is playful and humorous with quite a bit of action for as short as it is. Stegman proves himself a competent writer, creating an entertaining narrative and fully actualized characterizations. Lee’s artwork is energetic and dynamic with great style and inventive character designs. Overall it is a really nice, short piece that captures the essence of the Inhuman franchise, albeit in a succinct fashion. This entry was posted in Comic Book Reviews, Inhumans, marvel comics and tagged Charles Sould, Inhumans, marvel comics, Steve McNiven. Bookmark the permalink.